Towards the end of the book, Jude talks about how people are just an accumulation of past selves. Noah finishes the idea when he says the new selves stand on the shoulders of the past person and he calls them “wobbly people poles.” It’s a delightfully goofy teen idea but oh so true. Walt Whitman said it more eloquently when he wrote “I contain multitudes,” but the sentiment is the same. Nelson demonstrates this over and over again in I’ll Give You the Sun with characters who contradict themselves, make baffling decisions, and hurt each other. But they learn and grow; they use art to heal and keep adding to themselves. Their bond as twins makes it fitting that Jude and Noah come by this theory together. Alternating between Noah at thirteen, and Jude at sixteen, the narration separates the twins not only by voice but by time. Nelson uses first person present for both, so the reader is only able to experience the relatively brief periods of time that each perspective covers. It’s actually brilliantly structured, because Jude and Noah’s stories follow parallel dramatic structure and inform each other. As Noah’s summer unfolds and more is revealed about the death of their mother, Jude begins to make discoveries that will either foreshadow or connect to Noah’s half of the novel. This linked duality underlines the painful rift between two people who can never really be divided from each other. Nelson takes this even further by playing with the idea that every individual is the protagonist of their own story. She suggests that sometimes certain people are just meant to be in the same story, and that they’ll find their way into each other’s lives in unusual or unexpected ways. Nelson’s interested in how actions and decisions echo in our relationships, driving people together and apart. This plays out nicely in Zephyr, a tertiary character who is a significant figure in both Noah and Jude’s lives. His choices directly affect the main narrative even though he’s not a fully developed character. He doesn’t need to be; he’s an important player regardless, because they are all connected. Overall, the characters feel like authentic people, with the right amount of eccentric qualities to make them interesting fictional people. The parents are particularly compelling. There are hints at a complicated history between them that would be interesting even outside of the main narrative. Because the novel is told through their voices, Noah and Jude are the most developed. Noah has an extra spark perhaps, because he lacks Jude’s more overt quirkiness, with her biblical quotes and ghost grandmother. If there’s a character who’s overwritten it’s Oscar who’s a bit too much of a teen girl’s fantasy come true. “Some guys are born to lean,” Jude wisely observes. She’s right, of course (exhibit A: Jordan Catalano), but this guy has an awesome lean, wears a leather jacket, rides a motorcycle, has artistic ambitions, and is working very hard to rise above his troubled past. When you actually list his qualities you may want to roll your eyes, but in context he works because Nelson uses him in small doses and these details are revealed over the course of the novel. 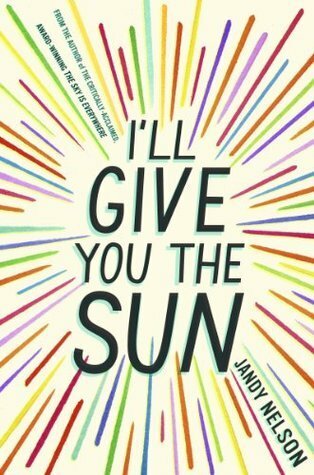 I’ll Give You the Sun has four stars and is on four year-end “best” lists. It’s publication in mid-September is recent enough that the buzz around it is still growing (although I think I was hearing positive things this past spring and the film rights were acquired in July). While the stars and lists are encouraging signs, history shows us that they don’t make any title a sure thing. I’ll Give You the Sun is one of my personal favorites of the year though; it’s also one of the best. *Seriously, just pulling YouTube link was incredibly dangerous. I can’t even momentarily glimpse that commercial anymore—instant tears. This is my favorite YA of the year and I hope, keeping fingers crossed the Printz Committee likes it, too. YES YES YES. Some have remarked on its too pat ending, but I think it’s a pitch-perfect conclusion to a tale about characters that you hope end up happily–and they do. A tangent… Maybe we (the royal “we”, that is) need to start reconsidering something in our analysis of literature – what exactly is the problem with a “too-pat ending”? For something to be more “literary” or “excellent”, does it have to be messier or open-ended or vaguely tragic? Sure, endings are absolutely critical to the success of a work, but are we ever as critical about the structure and the contents of the beginning or middle? I rarely read of characters being introduced in a way that is overly comfortable for the reader, or the description of places being too exceptional. Instead, we laud the characters’ development, or the “world-building”. Can we not give the same kind of credit to authors who neatly tie up endings? Of course there are limits to endings that stretch credulity, those that not only add a bow but a cherry on top, too. But overall, we’re oddly hard on books that close more neatly than we think they should. And isn’t this the crux of the “too-pat” complaint: really it’s a battle between those who want to read novels as an escape and those who want them to mirror what they know as their own or witnessed reality. But in this case it is a cherry on top — everything slots into place in a way that I found artificial. It’s the kind of neatness that didn’t feel organic to the novel. I loved this book so hard for so many pages, and I thought the voices were both marvelous, but the way everything comes together was a major disappointment. And I get that, Karyn – I had some other issues with this very-good-but-not-quite-great novel (Noah’s voice was so much stronger than Jude’s for a good stretch of time that I couldn’t wait to get back to “his” chapters), and the ending wasn’t exactly my cup of tea, either. But I do still wonder if we – as more critical readers than some – are too harsh on endings that tie more up than we would prefer. You raise a very good point, Brenda. In general, critics hold endings to a higher standard. It’s the literary equivalent of nailing a high note at the end of an aria, sticking the landing after a gymnastics routine, or cleanly landing a triple axle. The ending completes the art and therefore, those of us who are reading with a critical eye look for an ending that will either cohere with the whole or elevate the entire work. But, when I look at those last words, “Take a (second or third or fourth) chance. Remake the world,” I can’t help but think that this is a novel that leaves its characters at an emotional high point with the acknowledgement that their lives will continue to unfold just as imperfectly as they have so far. I don’t think this made as much sense to me on a first read. It’s only as I’ve revisited the text recently that I’ve started to come around believe that I had (and still have) a strong emotional response to those words because they remind me that sometimes in life, things are perfect. I hope that we’ve all had moments when it feels like everything is exactly as it should be. Everyone is with you they should be with, and everything is in order. And then people die. Or they make a stupid mistake. Or they want different things. And the only thing to do is continue to take chances. We need to learn and grow, keep adding to our “wobbly people poles.” I love those words because they remind me that in this novel, which is largely about our lives as story, the end is not an end at all. I’m not trying to retcon my first reaction. From a technical standpoint–looking at the construction in terms of plot–too many threads have to resolve in that last chapter, so it feels a bit like a very long, drawn out ending with everything resolving so tidily. Perhaps if some things didn’t fit quite so nicely it would read differently? I’m not sure. So while I still agree that there’s an issue with the ending’s neatness, I will argue that the ending is complex, moving, and definitely sticks the landing. Chiming in because I can’t resist to say that this novel inspired me in so many ways. Jandy’s version of the world is such a glorious one, and this story and its characters blew me away. I loved the family dynamics best, in all their variations. When Noah and his dad go out to dinner and only afterwards does Noah remember it’s his dad’s birthday . . .It’s the small, human moments like that one that make this novel so profound to me. I love this book so much. This is definitely my heart book, so I am clearly biased when I hope it ends up with a shiny sticker. What I think works really well is the format with two very distinctive voices. Often when novels have dual narrators, the voices start to blend together and that never happens here. The way the novel is organized also contributes to a pacing that propels the reader along at just the right speed. I also felt a strong emotional connection to the characters, but I agree with you Joy about not feeling manipulated. And Nina, I agree with you about the family dynamics which feel so authentic. I love this book so much it warrants my first comment on this blog! I was probably predisposed to like it already, given that The Sky Is Everywhere was one of my favorites. I think Nelson’s writing is breathtaking. There are these gems that are so beautiful that I gasped while reading it, yet the book never felt overwritten or precious. You know I will go to bat for this one in our Mock Printz!